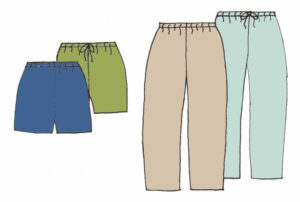 This casual pant or shorts pattern can be made with either elastic waist or tie waist. The roomy side pockets are perfect to keep your valuables. These pants and shorts will be the staple of his wardrobe because they are so comfortable, so plan on making several pair from assorted fabrics. Whether he’s working in the yard, on a fishing trip, lounging around the house or running errands, these shorts and pants will be his go to garments to wear. The downloadable PDF pattern comes with full size pattern pieces in your choice of two size ranges S-XL and 1X-4X. Pattern is designed for lightweight cotton knit, nylon or polyester fabric 60″ wide. The downloadable PDF pattern comes with full size pattern pieces. Included are complete illustrated instructions for construction of the garments. Sizes S-XL: pattern contains 4 sizes – Sm (34-36″), Med (38-40″), Large (42-44″) and XLarge (46-48″).